Bryan Paterson has been flying Birds of Prey at major shows and country fairs since 1978. He tailors his displays to suit your event whether it be a Country Show, Village Fete, Corporate or Family Fun Day. Option 1 - Mini Zoo consists of 2x 10'x 10' joined marquees with surround fencing. Cloth covered tables for attractive display tanks contained Meerkats, Snakes, Lizards, Spiders, Scorpions, Hissing Cockroaches, Giant Snails,etc Rabbits & Guinea Pigs in a raised tray for a hands-on opportunity. The area is set up to be interactive, with short talks and hands-on opportunities through the day. Animals may vary at different shows according to location and time of year. Option 2 - Mini Zoo & Birds Of Prey consists of 3x 10'x10' joined marquees with surround fencing. This option is the same as Option 1 but with the addition of several short interactive public hands-on flying displays adjacent to the static area. Option 3 - Mini Zoo & Brids of Prey consisting of 4x 10'x10' marquees. Incorporates all of the above, plus Birds of Prey static display presented in the display area with 2x 1/2hr flying displays presented in an arena designed by yourselves with a full commentary. The display will include audience participation with the opportunity for several show visitors to have a Hawk or Owl fly to their gloved fist. 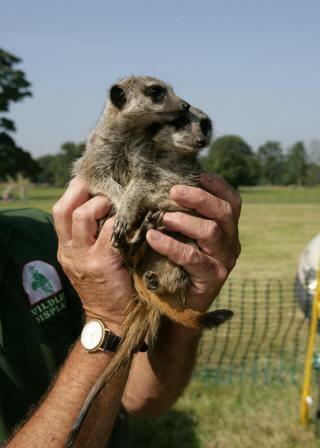 Option 4 - *** NEW FOR 2011 *** is the Mainly Meerkats Display consisting of 2x 10'x10' marquees with a Meerkat enclosure with family groups and a variety of other small animals for a hands-on experience. 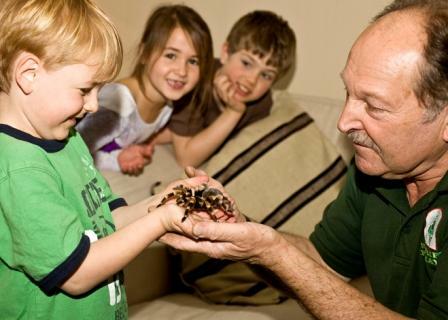 Wildlife Displays carries £5m PLI which allows for public handling of their animals and all licences that are required for animals to be transported and displayed in public for commercial gain. They supply NOW WASH YOUR HANDS signs and dispensers containing anti-bac hand gel.